BRANDON, MB – The Brandon Regional Health Centre (BRHC) Auxiliary is tripling their financial support for students enrolled in Brandon University’s (BU) Faculty of Health Studies Nursing and Psychiatric Nursing programs. 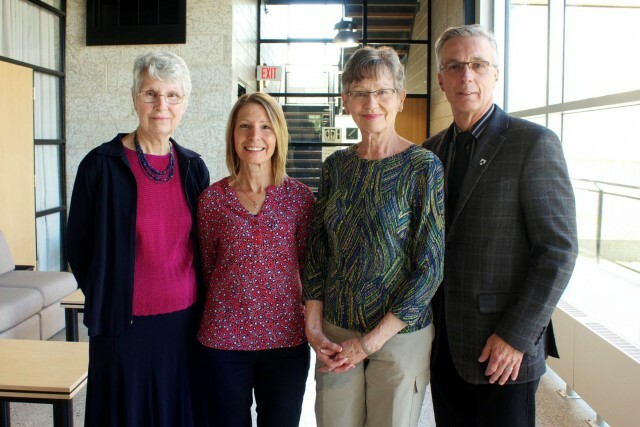 The BRHC Auxiliary endowment fund will increase from $70,000 to $140,000 when matching contributions are received from the Manitoba Scholarship and Bursary Initiative (MSBI). Additionally, the BRHC Auxiliary has committed to annually increasing each of their three bursaries from $1,000 to $3,000 per year. The BRHC Auxiliary also cites the increasing costs of tuition fees, books and other aspects of post-secondary education as reasons for increasing their support to meet the needs of today’s students; their awards directly support students with financial need. The BRHC Auxiliary Bursary Committee is comprised of Helen Dalling, Carol Davies and Sharon Hunter. The BRHC Auxiliary first established its endowment fund at Brandon University in 2002. Since then, the support of the Auxiliary has enabled numerous nursing and psychiatric nursing students to pursue their studies by easing their financial burden. Brandon University will celebrate its generous donors on Friday, May 22nd at the Brandon University Foundation Annual Luncheon, which recognizes BU’s Order of the Sheaf members. The Order of the Sheaf is an honour society that recognizes those individuals whose financial support has helped to ensure the advancement and quality of higher education at Brandon University.